The original organ, installed in 1959, consisted of 1015 pipes, 23 stops, 13 couplers (combining options,) and a full pedal board at a cost of $23,500. It was designed and installed by W.E. Pilcher, area representative of M.P. Moller Company, Hagerstown, MD. Van Dillon was the Trustees’ chair. The organ comprised a full principal and flute chorus with reed stops and mixtures to accentuate the sound. The first revision of the organ was done in 1977 by Michael C. Payne, area representative for Casavant Freres Limitee of St. Hyacinthe, Quebec, Canada. The pipes now totaled 1174. Fuller reeds and mixtures were added in addition to a sharper-sounding principal chorus. My understanding is that instrument was better-suited for congregational singing. The organ was cleaned, though not fully dismantled, when the sanctuary was painted in the late 1990s. The organ has been well maintained over the years, tuned semi-annually and repaired when necessary. mechanical-switching systems in the console and in the chambers, had begun to deteriorate. Filament contacts in the pedal system had ceased to work. Wiring was cotton-coated and had deteriorated. The reservoirs beneath the windchests had leather components and had begun to leak. After discussion with two companies, C.A. Zimmer Company was selected for our renovation process. In addition to repairing the windchests, bringing the wiring up to code, and adding some new stops (sounds), the Zimmer company suggested that the instrument be re-voiced, matching tone qualities of the Moller, Casavant and new Zimmer pipes. The result is a fresh sound for our organ. Many of the comments I’ve heard since Sunday used the word “clean” to describe the sound. Great listening! The “bells” you might hear from time to time are from a Zimbelstern (meaning "Cymbal Star" in German), an organ stop consisting of a star or wheel on which several small bells are mounted. When engaged, the star rotates, producing a continuous tinkling sound. It’s a celebratory addition to our organ for special occasions. 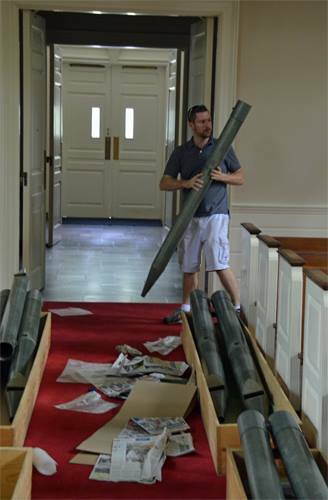 As our consultant, Nathan Bryson said, “The Moller organ at First UMC is a fine example of how effective a small instrument can be in a fine acoustic environment.” It has served us well and will continue to do so with the additions and improvements that have been made! Soli Deo Gloria!